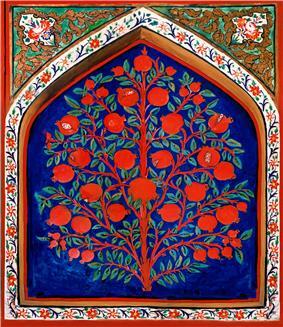 The Tree of Immortality (Arabic: شجرة الخلود) is the tree of life motif as it appears in the Quran. It is also alluded to in hadiths and tafsir. Unlike the biblical account, the Quran mentions only one tree in Eden, also called the tree of immortality, which Allah specifically forbade to Adam and Eve. Satan, disguised as a serpent, repeatedly told Adam to eat from the tree, and eventually both Adam and Eve did so, thus disobeying Allah. The hadiths however speak about other trees in heaven. ^ Brannon Wheeler Prophets in the Quran: An Introduction to the Quran and Muslim Exegesis 0826449565 2002 Page 24 "Abu Hurayrah: The Prophet Muhammad said: "In Paradise is a tree in the shade of which the stars course 100 years without cutting it: the Tree of Immortality." "
^ Oliver Leaman The Qur'an: An Encyclopedia 0415326397, 2006, p.11 "Unlike the biblical account of Eden, the Qur'an mentions only one special tree in Eden, the Tree of Immortality, from which Adam and Eve were prohibited." ^ Three Translations of the Koran (Al-Qur'an) Side by Side "Shall I show thee the tree of immortality and power that wasteth not away? S: But the Shaitan made an evil suggestion to him; he said: O Adam! Shall I guide you to the tree of immortality and a kingdom which decays not? " ^ Maulana Muhammad Ali Introduction to the Study of the Holy Qur'an 2011 "This in itself gives an indication that it is the well-known tree of evil, for both good and evil are compared to two trees in 14:24, 25 and elsewhere. This is further corroborated by the devil's description of it as “the tree of immortality” (20:120), ..."